I used an SU embossing folder and some Prima botanical paper for the contrast and I made the candy buttons from the same pad. Tomorrow is my great nephew's birthday, he will be 17 and I find it really hard to make cards for teenagers. I've kept it fairly minimal using a MB die and some hand cut clouds. I sponged through the waste for some interest on the insert. Lovely photo of Charlie, Val. He's growing so fast. Oh the cardigan card is brilliant Val, love all the details on the pockets and button band, I hope your sister is suitably impressed :0) Great teenagers card too, they are quite tricky aren't they!! Two fabulous cards, I love the shaped one, your sister will love it. The CARDigan is awesome Val - I really love the detail. When I first saw it I thought you had been knitting! The teenager card design is brilliant - I find it so difficult to come with ideas for teenagers and males. 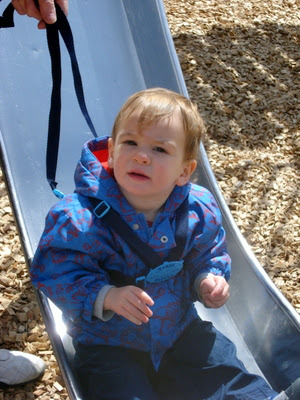 Love the picture of your beautiful Grandson - it doesn't seem very long since you announced his arrival - how time flies. the card you made for your sister is absolutely AMAZING, val!! the card for your great-nephew is pretty fab, too!! love the picture of your little Charlie... so cute! Well Val everyone's correct - I loved the CARDigan!!! lol That SU e/f was the perfect choice as it does look like it's been knitted. Bright and fresh colours are great. Must say I received lots of beautiful handmade cards - they are all fab. Sorry to hear you've decided to leave ATS but can quite understand. Great photo of Charlie Bear - wonder why he didn't fancy the swing? 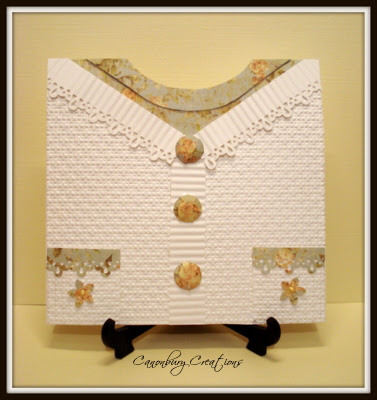 Gorgeous CARDigan, Val, and the CAS card for your great nephew is gorgeous too. Charlie is growing up so fast! He is such a handsome little fella. Well, darn, I had no idea it was Karen's birthday and now I'm late in wishing her HB wishes. But, then again, better late than never, so thank you, Val, for posting that. I absolutely adore the "cardigan" you made for her!! And your other card and, especially, Charlie were fun to see! They will miss you at ATSM!! Wow Val, your card for your sister is awesome, what a great way to use EF's, I'm sure she'll love it.I bet your nephew will be chuffed with his card too! Oh Valerie I have been missing in action and hadn't realised you had left ATSAM am sure you will be sorely missed. Charlie is such a cutie and looks all grown up. How times flies eh. 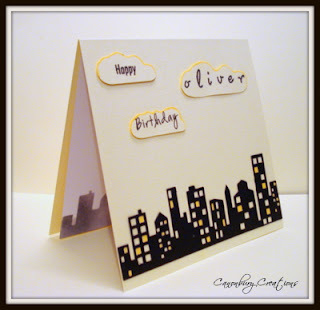 Karen's card is amazing and judging by her comment she was really pleased.love the skyline card very dramatic.